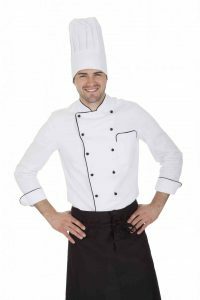 4 Benefits of Chef Jackets | Ace Uniform Services, Inc. Chef jackets are made with high-quality materials that are usually flame and heat resistant. As the hard hat is an essential part of the uniform for construction workers, the chef jacket is just as important to the chef. This uniform item is one of the most recognizable in the kitchen, but it’s not just about fashion. One of the most important benefits of a check jacket is the safety that it helps provide. They are made with high-quality materials that are usually flame and heat resistant. As chefs often work over open flames, they are susceptible to burns from the heat, flames, and splashes. The long sleeves of the jacket help keep the chef’s arms covered and protected from abrasion, burns, and other injuries. Because they have to work with such speed, it’s sometimes difficult to avoid these dangers, but the jacket will reduce the risk of injury. Spills and splashes are both common occurrences in the kitchen. While a chef is cooking, it’s almost impossible to not get food remnants on your clothing. While wearing a chef jacket, kitchen professionals don’t have to worry about ruining any of their own clothing. At the end of the day, they take the jacket off and are able to go to other events, activities, or errands without looking like a messIn addition, most chefs have more than one jacket in their closet. They are able to keep them in a rotation or even have more than one at work to change into if one jacket gets too messy in the kitchen. A chef is the face of the kitchen. They are the ones whose menu many people flock to that restaurant to enjoy. This makes them one of the top representatives of the restaurant. With that in mind. Wearing a chef jacket is one of the most important uniform pieces that a chef can wear. Many restaurants even have their logo or name embroidered into the lapel. Other chefs that don’t work in restaurants, but may have their own businesses, also embroider their name or the name of their business onto the jacket. Chef jackets are usually white. In hot kitchens, wearing a white top is helpful in maintaining a normal body temperature. They are also often made with materials that increase comfort and flexibility in the kitchen. Although they are jackets, they are light enough to ensure that the chef will remain comfortable throughout service. Справиться с морщинами поможет крем instantly ageless купить который вы сможете за пару минут. This entry was posted on Friday, May 11th, 2018	at 2:08 pm	. You can follow any responses to this entry through the RSS 2.0	feed. Both comments and pings are currently closed.